The next attraction in my weird chronology at Cedar Point is the Midway Carousel. This carousel came to the park in 1946 and I’m going to say that it was one of my first rides at the park. I’ve ridden it a few times, but I don’t really have any interesting pointers or stories about it. I’m sure my son will love it for a few years. Let’s move to the Midway in general. While I am going to go more in-depth about the general attractions later, if you want a complete run through of the Midway from a personal view check out this page I found over here. I can remember the Midway through its different ages, unfortunately I think it has been 6 years since I’ve been to CP. Looking at the current map a lot of the Midway’s heart is missing – but that is only from an abstract sketch. So here is how entering Cedar Point in the 80’s worked for non-season pass holders (this is important since season pass holders know more tricks). 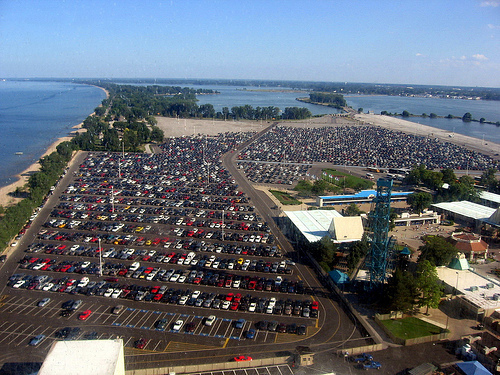 You would drive down the main causeway looking out over Lake Erie. Once you entered the parking lot you went to the first available aisle that the parking attendant directed you to. You would then haul your picnic basket over the picnic areas on either side of park entrance. On good years we had stopped at the KFC on the way to the park and we had that for lunch and again for dinner. We normally used the picnic area on the east side of the entrance. You then went and purchased your tickets at the kiosk booths only to run into the gambit of photographers. The photographers at Cedar Point are worse than the homeless in NYC. So much begging to take your picture so they could give you a little tag where you could buy it later in the day. Back then you didn’t even get to buy a “picture”, you purchased this little key chain you looked through to see an image of your wonderful day arriving at Cedar Point. At least it was a wonderful day before you got harassed by the photographers. You then hand your ticket to the ticket collector and go through the turnstiles. In front of you is the Midway, the welcoming you to the park. I would like to take this minute and point out some of the things the season pass holders are aware of. A season pass holder hardly ever drives up the main causeway. They will take the back road that goes right on the lake past all the summer houses. Upon arriving to the park lot we do a few things. Either we park in one of the back parking lots and skip the main entrance or we just drive past the parking attendant (sometimes we have to say we are dropping someone off) and drive to the front. Workers are always coming and going and it is always trivial to find a parking spot a the very front of the lot. You can actually see this in the parking lot photo above. I can only think of one time we couldn’t find one. Season pass holder normally can save at least 30 minutes here – granted we normally saved it by arriving at noon. Anyways….back to the Midway. Looking at the video above and even pictures the look of the Midway is by the loss of the Demon Drop (this of course is my personal opinion). Seeing that as one of the eye openers before you even go into the park is what really sold the Midway to me. 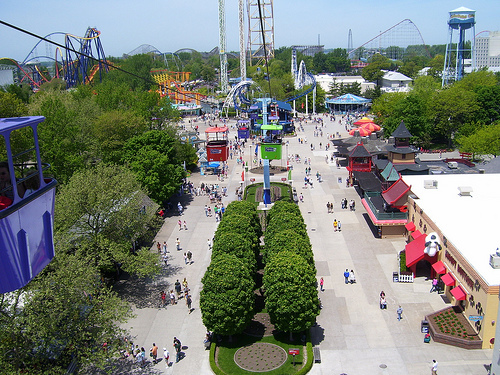 About half the park including most of the carnival games, kiddy land, most of the food, and a good part of the roller coasters are accessible from the main midway. In 1906 the Cedar Point Coliseum was originally constructed as a ballroom / dance hall. 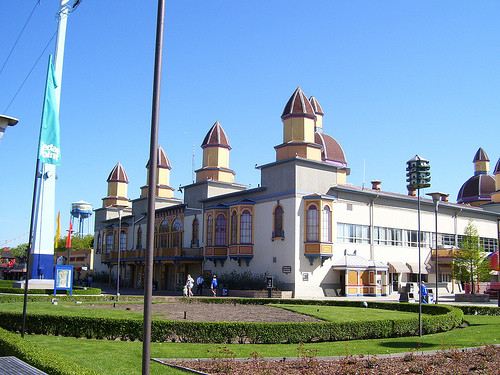 It was one of the main draws before it became a modern style amusement park. It attracted people from miles around. Without this building there would not be a Cedar Point today. I do suggest you read up on the history of the park to see all the great acts that have performed there. It wasn’t until my high school years that I even knew there was a functioning upstairs. I thought it was just one of those areas used for storage. I’m guessing it was the summer between my freshman and sophomore year that I had a youth group event for the Methodist church that took place at Cedar Point. Youth groups from all around congregated to spend the day at Cedar Point, and in the middle hold a worship ceremony. The worship ceremony and some other events took place in the ballroom upstairs. It was huge with hardwood floors. it looked dated – but it was kept up. Years after you can just go up the stairs and look inside. The doors are if there isn’t an event going on, but no one ever seemed to blink if it went upstairs to take a look. In my last story I stated that I would get to the great arcade scam of 1989 in this post. Remember kids, this was 23 years ago (HOLY CRAP! ), so I wouldn’t recommend trying this today. We didn’t have to deal with video cameras around every turn. There was generally two to four of us that went Cedar Point together on any given day. Our mothers would rotate through dropping us off and picking us up. We would be there for around 8 hours and usually were given some money so we could eat. We were all addicted to the arcade. The Cedar Point arcade is still one of the greatest ones I have ever been to. It really wasn’t one arcade though, it was multiple throughout the park. 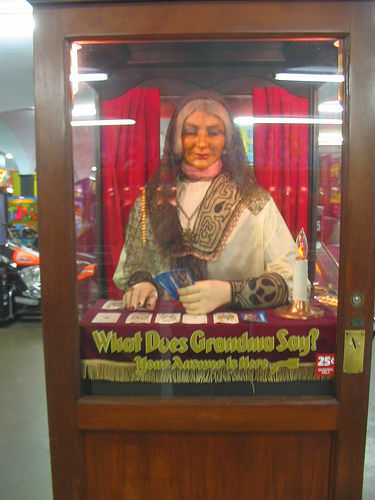 There was one near the entrance that held a shooting gallery and very few video games. There was the unattended one in Hotel Breakers. The concession area in front of Soak City (before you paid to go in) had one. A small one (still bigger than your average mall arcade) located near the Gemini. There was at least one in Frontier town that was about twice the size of the Gemini one. Finally the huge one on the first floor of the Coliseum. I am next to positive I am missing one though. So this is a grand total of six arcades in the park, but I am almost positive that I am missing one. One day the change machine swallowed a five dollar bill without giving us any change. We went up to the arcade attendant and told him what happened, he then proceeded to open the machine and returned our five dollar bill. We then realized that there was no checking he did to verify that we actually put money in the machine. Later we waited until we saw someone else put a five dollar bill into the machine. We then went up to the attendant and said we lost money in the machine again. He then proceeded to open it up and give us the five dollar bill. We would make the rounds in the park and normally do this at each arcade every other visit or so. All the money was promptly turned back into tokens and used in the arcade. So the loss to Cedar Point was the minimal use of the arcade machines. We never used it to profit directly, we only wanted to fuel our video game desires. There was however a greater heist done by one of my friends when I was seventeen. I was at home in the middle of summer and one of my friends comes tearing into my house. He wanted me to come out to his car to see something. He opens this duffel bag filled with cedar point tokens. We are talking about hundreds of dollars of tokens. Since I wasn’t there I can only relay what he told me. I guess an arcade attendant was getting ready to refill one of the token machines and had it opened. While he was removing the real money he had the token bag beside him. While his back was to the token bag, my friend swiped the bag and took off running. He said the guy started to chase him, but couldn’t go far since the real money part of the machine was still open. If the arcade attendants had used radios back then my buddy would have been screwed. 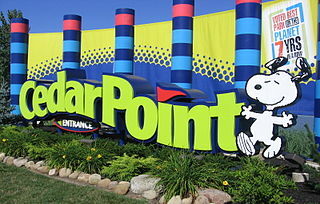 We did return almost all the tokens back to Cedar Point – one at a time. He would leave the duffel bag in the car and we would fill our pockets. We would just go to the arcade and waste hours and hours returning the tokens. Those were the years I would stay and play completely through one video game at a time until I beat it. Those were great days. 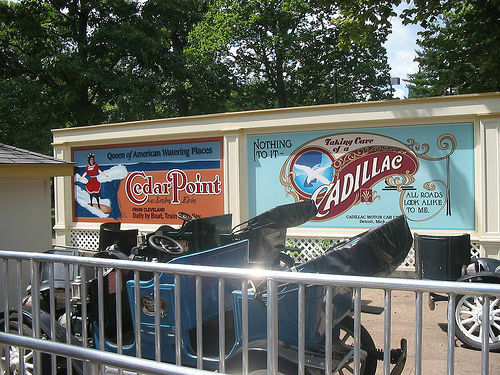 In the next part I will cover the Cadillac Cars, the Antique Cars, and the Turnpike Cars. Oh. My. GOD. The memories. My very favorite ride in the history of Cedar Point was the Haunted House. I loved and feared it when I was a little kid. Sadly, they demolished it one year to put in the Berenstein Bears thing (which I bet is gone now) and I never got over it. I also loved loved LOVED the carousel that was like a horse race. I could ride that thing 100 times. It was so fast and to my young self it seemed huge. What a great ride. The antique cars were another favorite. 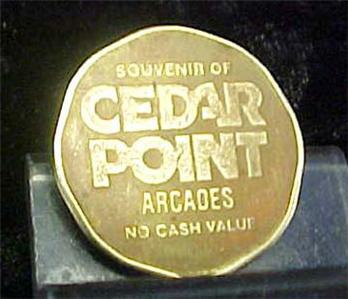 Well when I lived there essentially for a couple years it made no sense that I didn’t really have a big Cedar Point post. When I started to plan it out, the post was going to way too huge. So I then was going to break it up. The only thing that gave me any coherence to follow is the date that the rides / attractions entered. It also pushes me to get to the modern years. I don’t remember the haunted house, but I’m aware it existed. The one that was in the Berenstein Bears was the Earthquake ride. The Pirate Ride was the other dark ride style that I loved. I am going to do my best to get as many of the ride videos into the posts that I can. Yeah, after reading this and making my first comment I did some more reading and realized the Earthquake ride was where they put in the Bears thing. I never rode the Earthquake, I was too little at the time. However, I do remember the haunted house very clearly, just not exactly where it was located. There was a room where everything was upside down, and you felt like you were walking on the ceiling. Now I have to do some research and try to find pictures of the old haunted house. I love dark rides! Not coincidentally, my favorite ride in the whole world is Disney’s Haunted Mansion. You do know the earth quake closed 84. So I was 8 when it was finally gone.